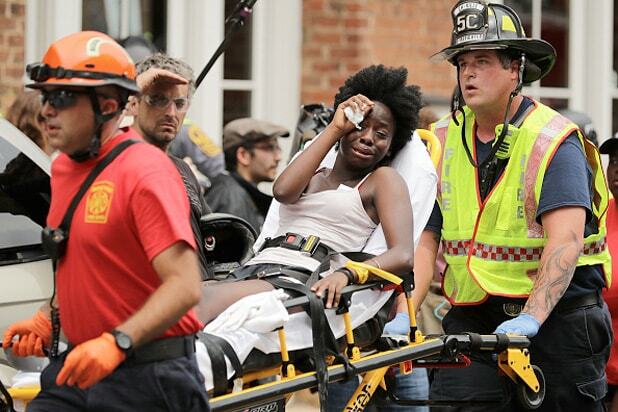 The unrest in Charlottesville, Virginia, intensified on Saturday, as vehicle plowed into a group of counter-protesters at a white nationalist rally, killing one and injuring 19 others, the Associated Press reports. More than 30 were hurt in total as a result of events at the rally. University of Virginia Medical Center spokeswoman Angela Taylor confirmed the victims count. Following clashes between white nationalists and counter-protesters in Charlottesville on Saturday, Virginia governor Terry McCauliffe declared a state of emergency. Police also demanded that hundreds of people vacate Emancipation Park, where a rally was scheduled to take place at noon. Groups of white nationalists descended on Charlottesville to protest the planned removal of a statue of Confederate general Robert E. Lee, and were met by counter-protesters, leading to violence that began Friday night and continued into Saturday. During Saturday’s clash between the white nationalists and counter-protesters, bottles have been thrown, and a violent war of words has erupted. Video footage shows a silver Dodge Charger racing down the narrow street, plowing into pedestrians before slamming into two cars. The Charger then threw it into reverse to escape the scene. MSNBC‘s Maya Rodriguez reported that people were being loaded onto at least half a dozen ambulances on stretchers, while paramedic were working on at least one person on the sidewalk who appeared to be badly injured. That person, who was in a neck brace, did not seem to be conscious at this point. President Donald Trump took to Twitter on Saturday, urging unity among Americans.